purpose of church | Welcome to Virgin Territory! Fussin’, feudin’ and fightin’ – Being “church” can get messy. The topic of “church” didn’t come up that often when we lived at the beach. Generally, gringos (I use that term for anyone not born in Mexico) came to Nayarit for vacations and fishing. The “fishers of men” thing wasn’t a high priority for people just visiting. It’s different here in San Miguel. Here there’s a large ex-pat population who call this town home, and for many of them an important part of putting down roots is finding a spiritual home base. 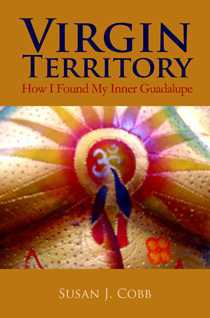 Virgin Territory How I Found My Inner Guadalupe was conceived at the beach, and is my chronicle of personal wrestling and self-perception along the lines of “where does one lodge one’s faith?” Some people opined that my thinking at that time may have been as soggy as the climate. Well, the search continues in this higher, drier, clearer climate. I don’t know that I’ve reached any definitive answer about what I say when asked what I am, but I’ve been open to exploration. The town offers a lot of choices. I’ve mentioned before that one of the places I’ve “lit” from time to time is the San Miguel Community Church, but though I recently acquired a name tag to wear at services, I’m still loath to put my name on any dotted line. It does seem that just as I am in search of self-definition, the Community Church is, too. Who knows? Maybe that’s what attracted me in the first place. My friend Al wrote about this church recently on his blog. His remarks are in response to a “wisdom offering” and ensuing discussion that I led last week at the early service. Not everyone, I am assured, would agree totally with his account of church history. All of this was before my time, but I’m seeing the various stories still inform current perceptions. If you’re interested, read what I said last Sunday, read what he wrote, and then read the comments after his blog entry. Yeah, I know. It’s messy. But that’s what I titled this piece in the first place! My remarks at the early service, San Miguel Community Church, March 22, 2015. I’m presenting these categories in reverse order, with an eye toward Easter and resurrection – from the slightly moribund, to the vital and transcendent. Any church can have elements of all four categories. The question is What is the foremost characteristic of an organization? I need to give Leonard Sweet credit for the concept of these categories. Monument church – we recognize them often by their landmark buildings. We also know exactly what to expect when we enter the door. I think of these churches the same way I think of McDonald’s. I don’t mean that as a disparagement. This is from someone whose car automatically veers to the right when I see those golden arches just this side of Leon. Breakfast at McDonald’s is a ritual when my husband and I drive to the coast. It’s not inspirational, but it is definitely comforting. We don’t have to make a lot of decisions. We are simply given a meal in familiar form to sustain us on our way. That is a good thing, but not transformative. Ministry church – This is a church which is all about people – helping them out, comforting them, feeding them, praying for them. The purpose of lifting and enlightening human lives unites the members of a ministry church as much as or more than any particular denominational elements. The primary motivation of a ministry church is service, both to the community and to one another. The Church at Jerusalem, led by the disciple Peter, was a good example. It drew members because of the love they felt expressed there, the individual sense of fulfillment when working as a group. Peter’s recognition of who Jesus really was, the embodiment, the incarnation of divine power, the Messiah or Christ, the tangible evidence of divinity embracing humanity, was the foundation stone, the rock, on which the human organization of Christianity was based. Peter’s glimpse of the coincidence of, that is “the being in the same place at the same time” of God and man, the living evidence of “God with us,” this Christ-power is what lay behind the good works, the healing work that he and members of the Jerusalem church went on to do. They ministered. They healed in the name – that is in the nature — of Christ Jesus. But still they carried a limited sense of what the life of Christ Jesus meant. They referred to themselves at that time as “people of the way,” a distinct sect of Judaism, limited to those who followed the laws of the prophets and whose men were circumcised. It was Paul, the former Saul whose reputation was made on the many Christians whom he had persecuted, who got an even deeper meaning of Jesus’ message. As Paul he carried that message to the far corners of the Roman empire, including not only Jews, but gentiles, slaves, and even pagans. He trained, educated and inspired others to do the same. The Message was powerful to grow the Christian church throughout the Western world. It still is effective when spoken with heart to those whose hearts are yearning. Monument, Maintenance, Ministry – ultimately it is the Message that moves individuals forward. And it is only as individuals hear and respond to that message that church moves forward as well.